Flounder Spearing just got a whole lot easier! Forget the heavy battery packs of yesterday and the restrictive and tangle prone leads. Farewell those heavy and dangerous kerosene and white spirit flounder lanterns of old. The Underwater 3 Watt LED Founder Lights we sell are better in every respect. Use them as a flood light or underwater. 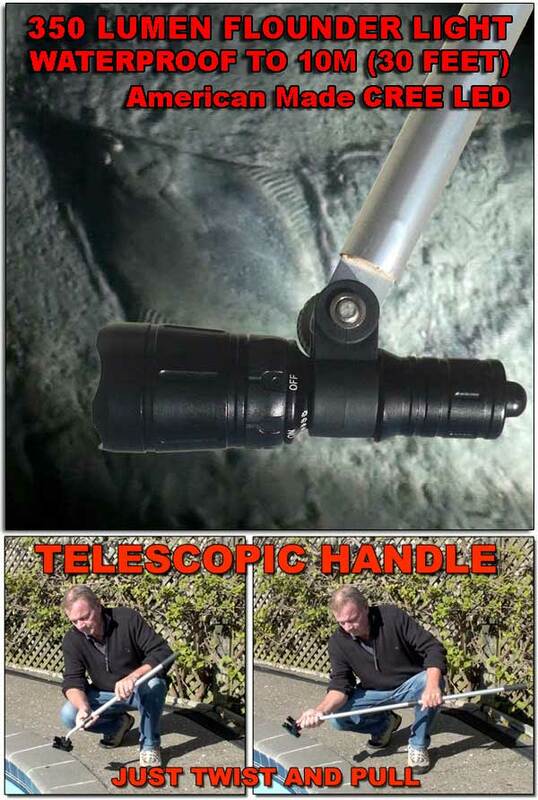 Check out the comprehensive list of features you get with these super bright LED flounder gigging light. 3 Watts 350 Lumens Gig Light Set. Light output is a blinding 350 lumens while using markedly less power than traditional tungsten or halogen bulb floundering lights. 700 Lumens Two Light Set. Get the two light set and enjoy double the power, this really helps in spotting flounder in less clear waters. Low Draw LED Bulbs. LEDs last longer and are more reliable than most standard flounder light bulbs. Up to four hours continuous use from one set of batteries. Smart Function On/Off Switch. Rotary magnetic switch with 10%, 50% and 100% Power Selections plus strobe and SOS function. Immerse in water or use above water. No more problems with corroded switches on flounder giging lights. Fully Watertight Seals In Torch Unit. Extensively sealed at both ends of wand to ensure minimal likelihood of the seal being compromised. 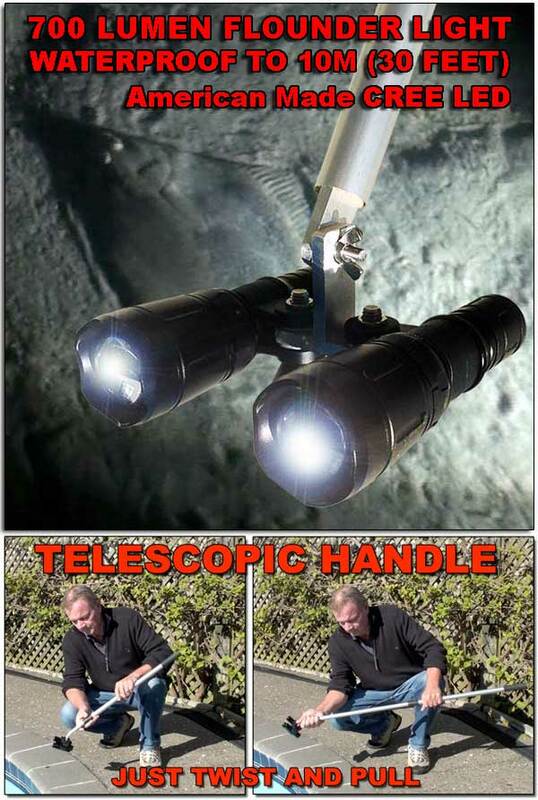 Telescopic Aluminium Handle. Easily set to the most comfortable length for your height. Ensures increased corrosion resistance when exposed to prolonged salt water usage. 3000mah Panosonic 18650a Batteries and Charger. Run times for these floundering lights vary according to your settings, but 4 hours plus is normal on full power. Note: Remove batteries when not in use as LED lights will draw residual power. The very best time for spearing flounder is on an incoming tide on a calm, dark night when the water is clear. A lot of people don't know when to go flounder fishing, or how to spear flounder, and are unsuccessful because of this. Spring and summer months are best but flounder can be taken year round. Too much rain causes dirty water. A rough sea surface distorts and diffuses the light. Either makes the flounder more difficult to spot, when both are combined it is best to stay home. There is no question that a tilly lamp or other pressure kerosene or white spirit floundering lights, (all of which generate light by a fragile, white hot, silk mantle) throws the best light. However, these flounder lanterns are heavy, a fire hazard and cause deep burns if the shade, frame or glass are touched while the light in burning as they get extremely hot. Tilly lamps also cause reflections in the water if wavelets or ripples are present. Whether you buy the budget flounder light above or one of our Pro Series Hi Power LED Flounder Lights you will find LED underwater flounder gig lights are safe, lightweight, and because the light is emitted under the surface the beam is less affected by surface ripples. 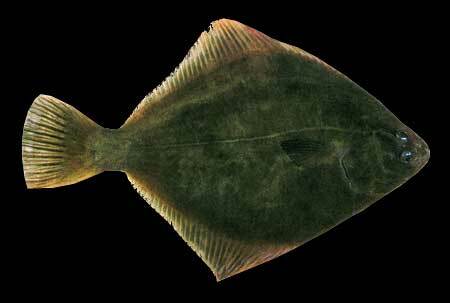 In addition to a lamp or underwater light you will need a flounder gig or spear. Multi pronged gigs with up to five barbed prongs are not recommended in New Zealand as they damage the fish and tear the flesh when pulled out. A single prong flounder spear with no barb or a very small barb is much more practical for the smaller New Zealand species. Pin the flatfish to the seabed with the gig, then reach under the flat-fish and hold in onto the gig from underneath the belly. Flounder gig tips should be kept sharp and enclosed with cork or plastic tube for safety when not in use. An aluminum flounder gig is lightest but can corrode. Paul's fishing kites has flounder gigs for sale, theirs have a stainless steel point mounted on a hardwood shaft. Multi prong flounder gigs are often necessary for larger flounder like those found in the South of the USA particularly when gigging from boats. Hardwood shaft tipped with a stainless steel prong. Note: Flounder Spears and gigs are not available for shipment outside of New Zealand due to their length. A catch bag or satchel with a shoulder strap is ideal for carrying the catch and refreshments in. Complete flounder gigging setups include good waterproof shoes, neopreme divers boots or sailing shoes are best. Floundering in bare feet is likely to result in cuts if pacific oyster shells are in the area. Wearing a cap light or head lamp is also a good idea, it will serve as a back up light source - and is useful for seeing further afield than the range of the underwater flounder light. Stingrays pose little threat when flounder gigging although sometimes they will take an interest for a while and follow you. If wading through cloudy water, or if your gigging light goes out, shuffle your feet close to the bottom, if you accidentally walk into one it will usually just swim away. Yes we do ship our LED Underwater Flounder Gigging Lights to the United States and around the world. Contact Us for more information about our flounder lights.